I'm a huge advocate of the World Book Day initiative. Schools across the country give out millions of vouchers that enable children to receive a free book or £1 off a book of their choice. It isn't often that I'm tempted to purchase a World Book Day Book as I can usually devour them in about an hour. 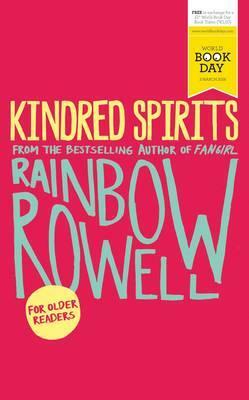 Since this one was written by Rainbow Rowell, I couldn't resist. I'm pretty new to the Rainbow Rowell fandom but she's now my favourite contemporary author (and Fangirl is my favourite contemporary book). Kindred Spirits is a super sweet short story about two teens who connect over their love of Star Wars. I can't think of a more appealing book prospect than Rainbow Rowell plus Star Wars! Even though the book is short, the characters felt well developed and the plot was really entertaining. Rainbow Rowell has this super power of making you really root for her characters, even the minor ones. For me, this is mostly because of the killer dialogue and the thought put into characters' back stories. This book could not be more of a bargain and for only a pound there's no excuse to miss it! My only criticism? I wish it had been a full length book as I wasn't ready to let these characters go. -Everything by Rainbow Rowell. Immediately.